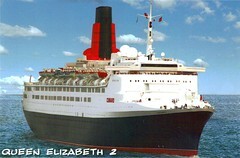 A postcrossing postcard of the muchg loved ship QE2, received from Kai in Germany. Kai is a prolific postcrosser who has sent postcards more than 1.1 million kilometres in the last two years, to make him one of the most active members in Germany. Congratulations, Kai, and thanks once again for such a delightful card.